To setup an alert, you must first have integrations (places the alert will be sent). Then, you must specify a plugin to use for the alert, the result that will trigger the alert, and which connected AWS account will be used. 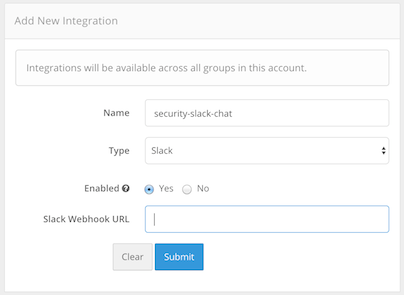 In this example, CloudSploit will integrate with Slack. 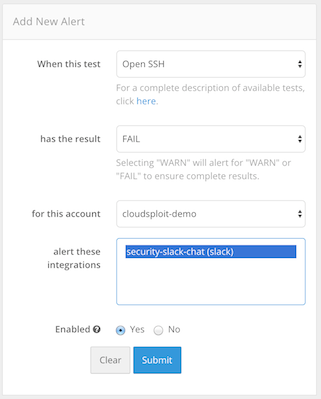 Open the "Integrations" page in the CloudSploit dashboard. Add a new integration by selecting an integration type and then completing the custom fields for that type. Navigate to the "Alerts" page and configure a new alert using the form. Note: Selecting a "WARN" result will trigger the alert if the "WARN" or "FAIL" result is detected (since "FAIL" is more severe than "WARN"). You can edit your alert in the future by clicking the "Edit" button on the page.